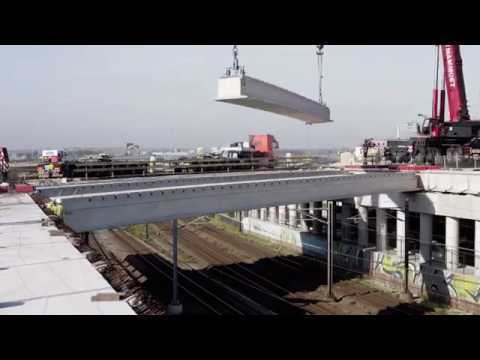 Spanbeton designs and assembles beams for one of the biggest viaducts near Amsterdam. At the end of September 2016, Spanbeton delivered 43-meter long beams for the new A9 motorway viaduct just outside Amsterdam. The viaduct goes over a railway track and several other roads. A prestressed precast solution was requested very early in the tender phase, by contractor Van Hattum and Blankevoort (a VolkerWessels company). The bridge deck was divided up into 5 different skew-spans. The main span of 58 meters was at a skew of 45°. The beam length was able to be reduced to 43 meters by a rotated beam position and wider span. The final deck over the track was assembled during the weekend in just 52 hours, ensuring that traffic was disturbed as little as possible. Rob Visser, project manager at CBB comments, “Because of Spanbeton’s expertise in precast concrete, the production and installation was cost and time efficient”. He continued, “The beams are all made in the factory and only need to be assembled on site. This saves hours of work at the construction site, thus reducing any inconvenience”. Diverting the A9 at Badhoevedorp reduces noise pollution for nearby residents and also improves air quality for an overall better quality of life. The project was completed by a partnership between BadhoeverBogen, Volker Wessels companies Van Hattum and Blankevoort KWS and Vialis, Boskalis and Mourik Groot-Ammers. At the end of 2016 the main A9 carriageway from Haarlem (Raasdorp) to Amstelveen opened up and in the spring of 2017, the road on the other side will be in operation.